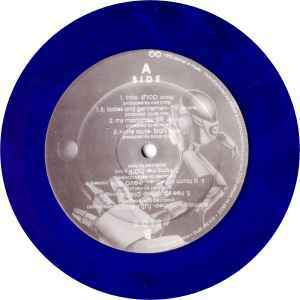 This is a bootleg pressing of the original <a href="http://www.discogs.com/release/4236"><b>Planet E</b></a> release on marbled clear blue vinyl. The original was first pressed on grey marbled colour vinyl. This bootleg originates from the UK and was supplied in a clear PVC sleeve. Side C and D labels are swapped round so they are attached to the wrong sides in error. The original catalogue number (PE VARI US 010 LP) does not appear anywhere on the release. Disc one has "BEATS" etched into the run-out groove, disc two has "BUG" etched into the run-out groove. Additionally disc two is marked with sides A/B in the run-out rather than C/D. Both sides of disc one "BEATS" suffer from a very bad pressing, with blistered, pock marked vinyl which makes it almost unplayable, and surface noise/crackle is actually louder than the audio. Disc two does not suffer from these problems. It is possible to see where the original labels were scanned in to produce the labels for this bootleg, as the scan loses clarity towards the centre of the labels. Disc 1, B3 incorrectly credited to Eevo Lute. If you own this & it came it the clear plastic double sleeve I suggest you either take them out of that PVC or put the records in inner sleeves so the vinyl is not touching the clear PVC sleeve. In fact forget all that just chuck record 1 straight in the bin.